The history of the Cholmley family and their relationship to Whitby: ( 1600 - 1657 ) Whitby is documented in an extraordinary collection of papers written by Sir Hugh Cholmley between 1648 and his death in 1657. An important figure in Yorkshire, Sir Hugh produced three so called "Memorials" describing events in the Civil War, among them an account of his defence of his defence of Scarborough Castle in 1645. They are gripping read - action packed narratives of politics, battles and intrigue. After his wife`s death in 1655, Sir Hugh also began work on a set of memoirs, comprising of not only an account of his own life, but also a history of the Cholmley family from the reign of Henry VIII. They chart the family's rise to prominence in Yorkshire in the wake of the Dissolution of the Monasteries and the subsequent squandering of the family fortune by Sir Hugh`s father and grandfather. The memoirs focus, however, on events of Sir Hugh`s own life. After a turbulent youth, he proved adept at managing his estates and succeeded in paying off the debts he inherited. Writing of his life in Abbey House before the troubles of the Civil War, he reminisced that he had, "lived in as handsome and plentiful a fashion at home as any gentleman of my rank in all the country; I had between thirty and forty in my ordinary family, a chaplain who said prayers every morning at six, and again before dinner and supper; a porter who merely attended the gates which were ever shut up before dinner when the bell rung to prayers and not opened till one o`clock, except for some strangers who came to dinner, which was ever fit to receive three or four beside my family without any trouble and what ever their fare was they were sure to have hearty welcome. Twice a week a certain number of old people, widows or indigent persons, were served at my gates with bread and good pottage made of beef, which I mention that those who succeed may follow the example. Sir Hugh`s son, another Sir Hugh (1632 - 1689 ), also wrote the beginnings of his own memoirs as well as several accounts of incidents in his life. This combined collection of family papers is an invaluable source for the history of Whitby and offers many fascinating insights into seventeenth-century life in England. Whitby Abbey`s new world class visitor centre is all set to attract huge crowds. The architecturally innovative visitor centre has been built in the shell of the 17th Century house which nestles in the shadows of Whitby`s medieval Abbey. Officially opened on Easter Saturday, 30th March 2002, the visitor centre marks the completion of the �5.7 million Whitby Abbey Headland project to give greater public access to the natural beauty historic character and archaeological richness of this corner of the North Yorkshire Coast. Rare 17th Century cobbled garden courts in front of Cholmley`s House, in which the centre has been built, have also been restored as part of the four year-long partnership project, between the English Heritage, local councils and Strickland estate, with the funding contribution from the Heritage Lottery Fund and the European Regional Development Fund, as part of its Regional Challenge. The new visitor centre has been placed discreetly behind the fine classical facade of the Cholmley`s House. The Cholmley family acquired Whitby Abbey and its land after the dissolution of the monasteries in 1539 and lived in the abbey`s lodgings and the gatehouse until they built the Banqueting House. Costing the princely sum of �232,000, money for the development came from a fortune amassed from the local alum industry and Sir Hugh Cholmley`s involvement in building a fortified harbour wall in the English colony of Tangiers. During the 18th Century the Banqueting House fell into decay after the loss of its roof to a storm in the year 1790. The decay was arrested after the property and other abbey buildings came into the possession of the Strickland family, whose descendants still own the house today. They secured walls by fitting bracing arches in 1866, replaced when the property and abbey ruins were handed to the Ministry of Works in 1936. Walking through the newly-restored gateway and cobbled courts towards Cholmley`s House is like being transported back 300 years in time. But step through the doors of the new visitor centre and the experience is unmistakably 21st Century. Together, English Heritage and York based interpretation company have used the best digital technology to offer visitors an unprecedented window on Whitby`s past. Installing the most advanced computerised displays of any English Heritage monument in the country. Results from recent excavations have been used to conjure up a virtual reality tour of the headland in St Hilda`s day. Projected onto a 12 metre long screen, it gives a breathtaking sea gull`s eye view of the landscape and the Dark Age monastery. Words are provided by 8th Century nun St Aelfred on an "audio-wand" which visitors are given on arrival at Whitby Abbey. She was a real-life abbess and relates the story of her own time, taking a ghostly flight forward through the centuries to offer a unique perspective on the dramatic times that followed, including the dissolution of the monasteries in the 16th Century to the shelling of the abbey walls during the first world war. There are other figures from Whitby`s past elsewhere in Cholmley`s House. Talking Heads is a series of historical characters played by costumed actors who tell their own story in their own words on video screens. By pressing on screen buttons, you can even strike up a conversation. 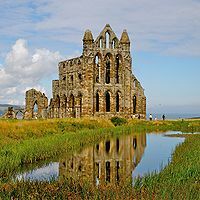 St Hilda explains why the abbey was founded here in 657AD: Sir Hugh Cholmley II informs of his past : Frank Meadow Sutcliffe explains his wonderful skills in photography : Bram Stoker informs of how Whitby inspired him to write the book "Dracula". Then after being guided through this rich tapestry of history, it is time for the visitor to set out and discover Whitby Abbey`s dramatic ruins for themselves and help create a new chapter in the Whitby story of past and present.